"Strawberries and spinach are delicious in the Spring, and tossed with other fresh ingredients, real bacon, and hard cooked eggs, they make a wonderful salad. A sweet, tangy oil and vinegar dressing tops it off!" Place the eggs in a saucepan with enough cold water to cover. Bring to a boil and immediately remove from heat. Cover, and let eggs stand in hot water for 12 to 15 minutes. Remove from hot water and cool. Peel, chop, and set aside. Cook the bacon in a skillet over medium high heat until crisp and evenly brown. Drain, crumble and set aside. 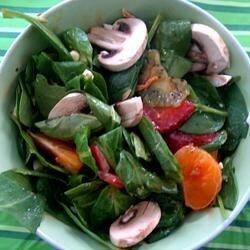 In a large bowl, toss together the eggs, bacon, spinach, mushrooms, strawberries, onion, kiwi, and orange. In a separate bowl, mix the ketchup, water, olive oil, brown sugar, cider vinegar, and brown mustard. Season with garlic powder, salt, and pepper. Pour over the salad mixture, and top the salad with croutons. This bright and tangy salad is sweet and savory, and just delicious. I made this for dinner last night, added rotisserie chicken. My husband loved it so much, he must have complimented me 10 times. Definitely a keeper. Thanks for sharing!